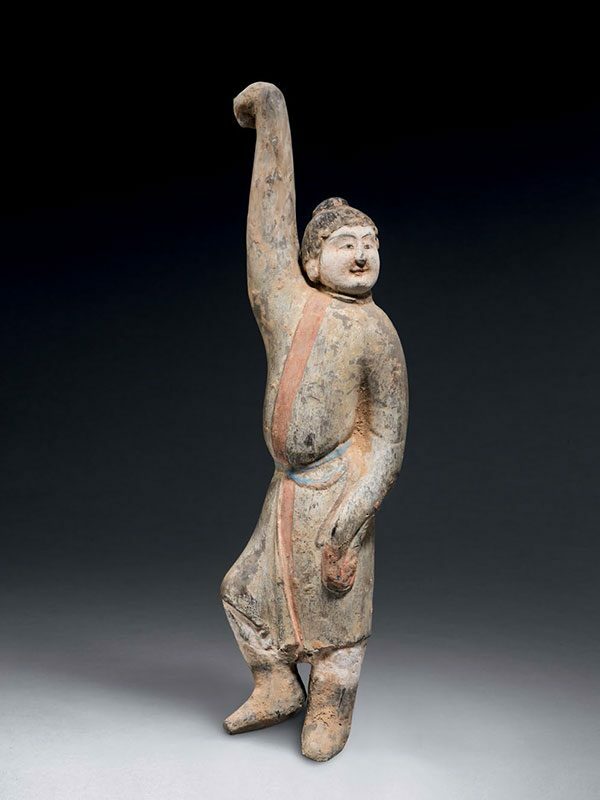 A pottery model of a male dancer of foreign appearance, standing tall and turning his head towards his left. The slightly portly figure reaches his right arm towards the sky, whilst he holds his left arm loosely pendent alongside his body. His right knee is bent and forms an angle with his left foot. The figure is dressed in a long-sleeved, three-quarter length layered robe, with a high circular collar up to the neck and over-length long sleeves covering his hands. The robe is loosely draped above the top of his pointed black boots. His arched eyebrows, eyes and prominent nose, red lips and stylised black hairs are depicted in fine detail. The pigments of his robe with red trim and blue lace are well preserved.